Brother MFC-845CW Drivers Download. The Brother MFC-845CW comes with equipment at the highest levels, including Wi-Fi. In May 2007 Brother's MFC-845CW excels at the endowment. 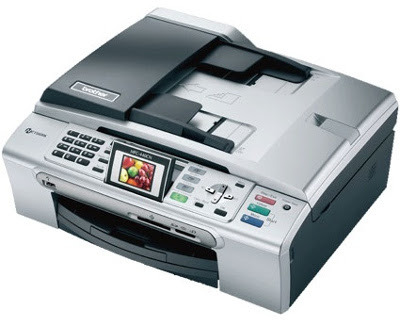 In addition to the normal operations of printing, copying, scanning and faxing on multifunction devices, it includes an 802.11g / b wireless network, a Fast Ethernet connection, a DECT handset, an answering machine capable of storing up to 29 minutes of messages, a multi-media card reader and a PictBridge USB socket for transferring images from a USB stick or compatible camera. Brother has succeeded in enclosing all this in a compact size device. The controls are arranged optimally and the functions of each clearly indicated. At the center of the control panel there is a 2.5 "LCD screen, with tilting adjustment, whose task is to display the working information and the photographs present on the cards inserted in the media card reader. The PhotoCapture Center integrated into the MFC-845CW allows you to crop photos, change brightness and contrast and other basic operations. The paper tray is divided into two parts. The lower one is for the common A4 size paper or envelopes and postcards, the upper part acts as a folder for the sheets and at the same time as a magazine for 10 x 15 photo paper. To add the paper, pull out the tray completely and lift the top. The USB connection for the computer is located inside the device and can be accessed by lifting the scanner cover. The four printer cartridges are located in the front right side protected by a plastic door. A very practical position that does not force you to open the frame as you must do in most cases. Each compartment has the color of the cartridge to be inserted, there is no other method that prevents the incorrect insertion of a cartridge. The MFC-845CW does not allow simultaneous operation of the two wireless and wired network interfaces, but only one at a time. The drivers installation disk contains a procedure guided to the installation of the wireless network. The print quality is excellent with pictures and photographs, discreet in the copy.